When I read the above quote, I felt so full of gratitude. First, to God, whose love and guidance I always felt ….even in my darkest days. Secondly, to myself…to the strong and resilient woman within that I didn’t even know existed before. And also to my support system of family and friends who stood by me and saw me through so many challenges. 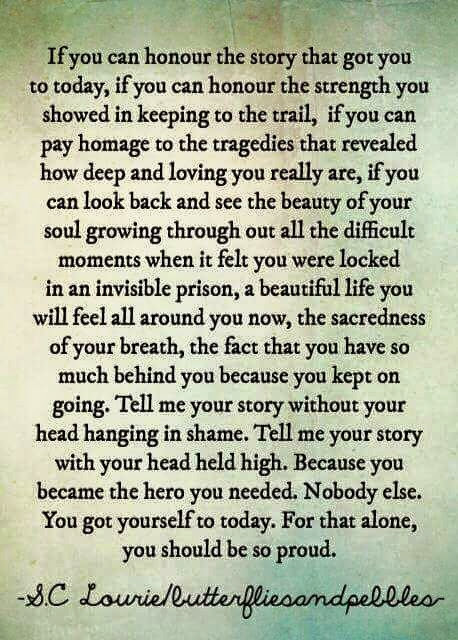 I do honour my story. Not because it was good….it wasn’t. But, because it is a story of faith, and strength, and hope. I know life will always be full of challenges, but I also know so much more now about my ability to handle them, and to trust God. I am feeling so incredibly blessed and grateful right now. My painful journey has brought me to a place of peace with my life and excitement for my future.